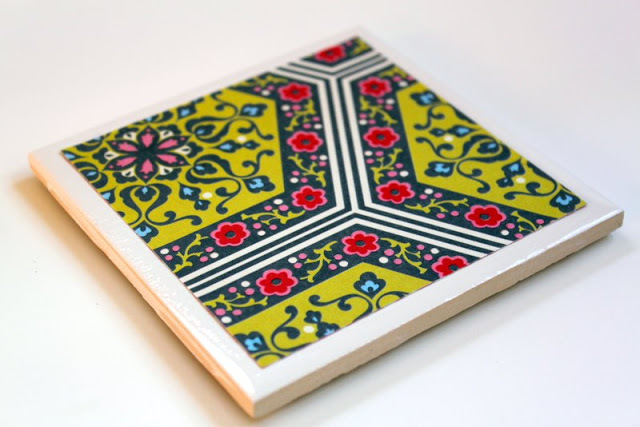 There’s nothing better than a handmade gift and this Tile Coaster Tutorial will do the trick! What better way to celebrate than with some fun, festive coasters. 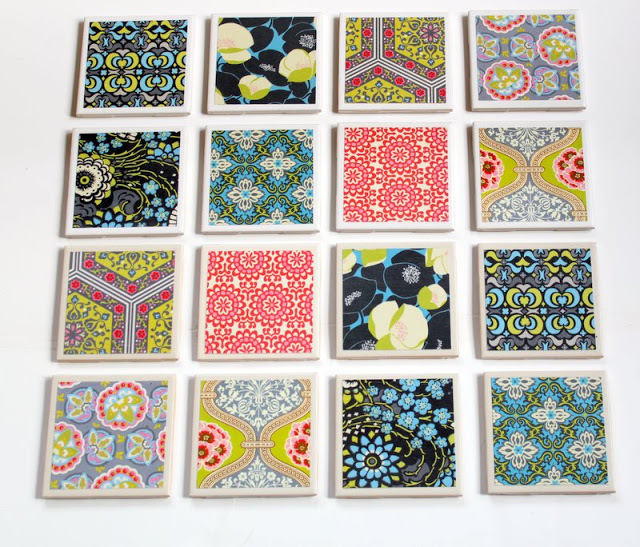 These coasters are made from inexpensive tiles from the hardware store and are embellished with fun, designer scrapbook paper. 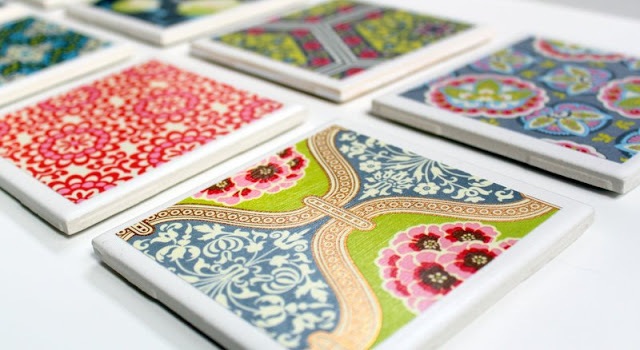 Make these coasters as a gift or make them for your home – either way, they are sure to get noticed! 2. Brush one coat of Mod Podge onto tile. 3. Place one piece of paper on center of tile. Allow to dry. 4. Brush on another coat of mod podge on top of paper. Allow to dry 15 minutes and repeat 2-3 more times. 5. After mod podge is dry, take tiles outside and spray with clear acrylic sealer. Follow manufacturers instructions. 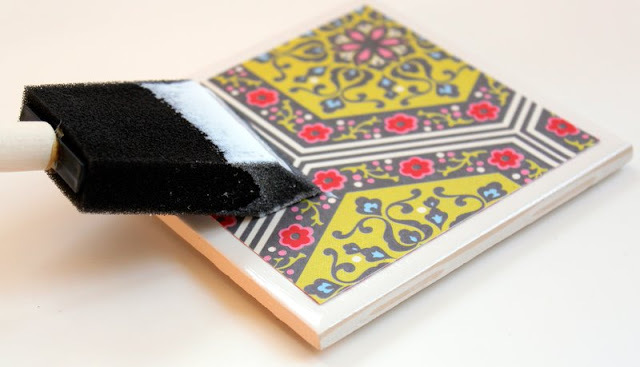 The sealer makes these tile coasters water-resistant. 6. Allow coasters to dry completely. 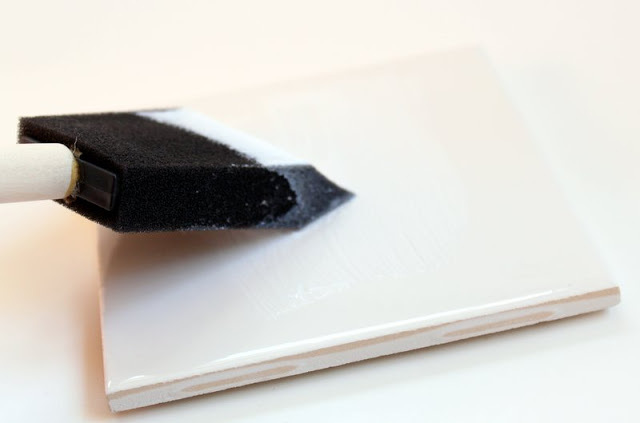 Once dry, glue felt squares to the bottom center of the tile. 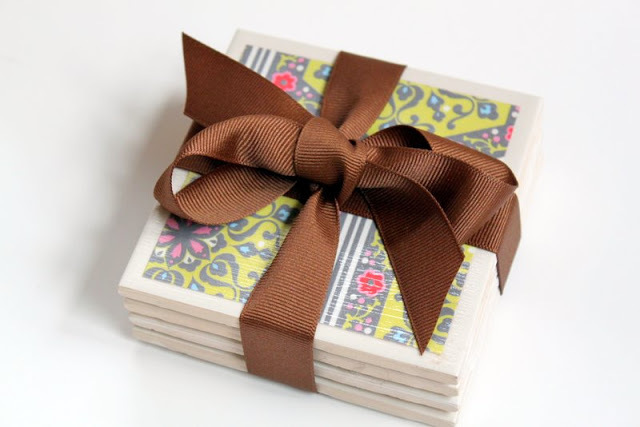 Wrap four of these coasters up with some beautiful ribbon and you’ve got a gorgeous handmade gift. And finally, grab yourself a cocktail and toast to a wonderful New Year! I saw these featured in the magazine and fell in love – GREAT job! Well done! Can’t wait to try it myself! Hi, are these coasters also heat resistant? I have tried something similar to this with cork coasters and paper but the mod podge was the same as well as acryllic spray. Mine were not heat resistant….the coffee cup stuck to it. I made several sets of these and they all came out ‘sticky’. Coffee cups and cold drinks stick to them. Any suggestions? I was going to make this project as a girlfriend gift for my birthday group. Coffee cups and cold drinks sticking would not work. Did you follow the directions exactly…and did you hear back from anyone as to resolve this. Your input will be appreciated. This is a GREAT tutorial. Don’t use an acrylic sealer. Go to a car parts store and get clear engine paint. Make sure it has a high heat resistance. At least 500 degrees. My coasters keep sticking together. How can I resolve this issue? Don’t use acrylic sealer. Go to auto parts store and get clear engine paint. Make sure it has high heat resistance, at least 500 degrees. (passed along from Leslie). Such a great idea!! 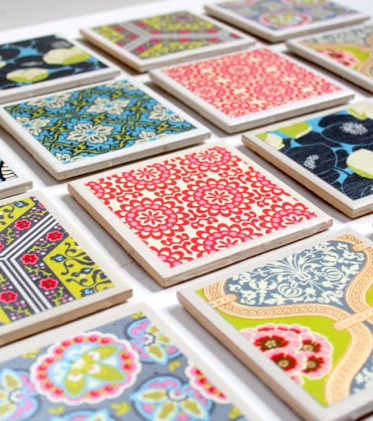 Match the coasters to the decor! What a great gift for new home owners, or just a birthday! I am so going to try this. I hate to say it, but I have used my Christmas coasters all year long. I really need to do this craft!! Love it! What great handmade gift idea! I just came accross your blog and I love it all ready! Beautiful…they have inspired me to use this great idea for some fun home decor!! Where did you get that beautiful paper?? I LOVE it!! I will definitely share when I get them done! love the papers you chose- gorgeous! 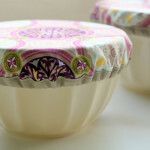 and I love it that we have the same ikea white… were you tempted to get one of their fabulous patterns (like I was)? but my sister kept reminding me that all white is so much more uniform and less busy. AND if I need more, then I will be able to get the white ones but not the patterned ones- hahaha! Great idea! And gorgeous paper. Well done! I actually just got a set at christmas from my mother in law…super cute..think i might make some more now that i know how and use some pictures instead of the scrapbook paper!!! LOVE your photos, and this is one of the best coaster tutorials ever. You rocked them! great idea! I definitely think I am going to try this – thanks for sharing! VERY cute! And the idea above about using pictures is a great idea! So happy you posted this tutorial!! Can’t wait to make some 🙂 thanks! Thank you all for your super-kind words!! The paper I used is Amy Butler’s and I found it at Michael’s. 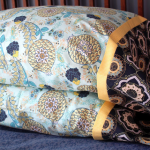 I bought it in big packs of about 50 sheets each, so look for it in that section – you won’t be able to purchase just individual sheets, but it’s so great for many different projects! Quick question…any tips on how to get these to dry completely? Mine always seem to be sticky ~ even days later. Thanks! Very cute! The Mom’s Day Out program my son used to attend made these with photos of the kids as a Mother’s Day gift last year. I think mixing them with scrapbook paper would make a great grandparent gift. These is a great idea for a housewarming gift. You can coordinate all colors and designs. Thanks for sharing. Can’t wait to try it. Thanks for sharing ☺. Now all I have to do is find me some tiles. Great tutorial!! Going to have to try this myself at some point to use up some of my own paper. So happy to have found this!! Saw these on At Second Street. They are absolutely lovely. New to your site, can’t wait to look around more. I am definitely becoming a follower and I am going to add these to my to do list. Its a fantastic Blog. Once the tile and grout cleaning has been thoroughly cleaned and dried we will apply a grout sealer. This protective grout sealant absorbs into the grout to keep your grout clean and protect it from stains in the future. 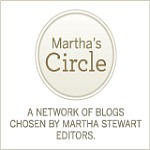 Just stumbled upon your blog & it is wonderful! This is a great idea; keep up the good work! I tried making one and it looks very good! I think I can even make a living with these coasters here in Sarasota! 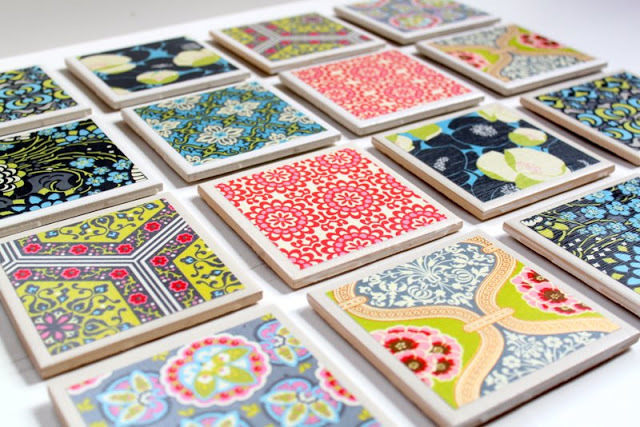 Tile coasters are something that my neighbors would love, I’m certain of it! 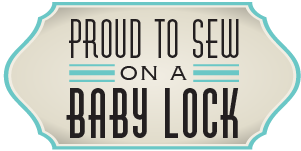 After all, we are hand-made and DIY gift lovers here in Sarasota. Flooring companies can make whole bunch of beautiful tiles like this, I think – in case you guys are planning to stock up on beautiful tiles like this for your coaster project! 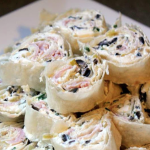 Making these tonight, thanks for the idea!!! I finally know what I’m going to do with my scraps! What a great idea this is. This is so great! Hey, how does mod podge hold up to heat? Would this work as a hot pad in the kitchen? I have made coasters using one layer of cocktail napkins and modpodge. To finish though, I paint on about 3 coats of polyurethane. I had trouble finding a spray sealer that would withstand the heat from my coffee cup. Not sure how the poly would work with hot pan from the stove though. Am definitely going to give it a try. 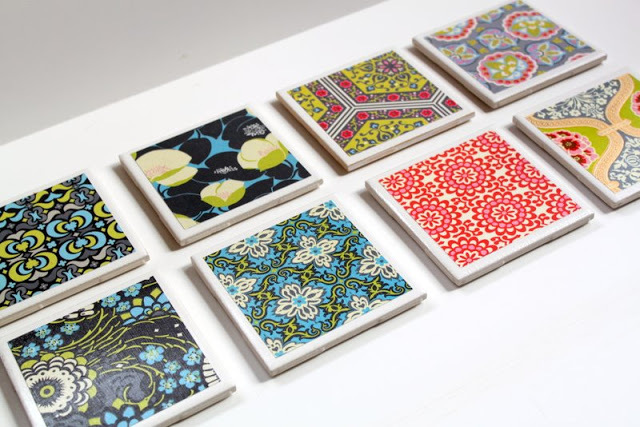 Could have a matching set – hot pad and coasters – by using a larger piece of tile. I just made these coasters yesterday. They certainly came out beautiful and I appreciate the tutorial! Unfortunately they are non-functional, just merely decorative. I tested the coasters after one day of letting everything dry and my coffee cup got stuck on one of the coasters! lol! I will make these again on larger tiles and use them as decoration on my wall. I am dying to find something that will withstand heat from my cofffee cup. Have any of you ladies had any luck? Thanks again for the tutorial! I found someone that said to use Envirotex Lite Pour-On High Gloss Resin or something similar. It is an epoxy that is used on counter tops and you will not have a problem with it! Thought I would share. I had the same issue with the heat/moisture. Although the tiles looked pretty i couldn’t rest anything on them without them sticking. I had tried a variety of Mod podges and sealants without success. I then went to my local art supply store in Newtown. They sell a ‘glass finish’ resin, one of those things that you mix bottle A with Bottle B (it was about $24 and enough for about 12 tiles 10cm x 10cm). I used this over the top and its perfect. Its both heat and water resistant. Hi, would you mind e-mailing me the exact name of the resin you used? This is making me craaaaaaaaaaaaaaaazy not having something that works for hot mugs! I’ve spent a ton of money, too…polyurethane, polyacrylic, acrylic, floor sealer, stone sealer… ACK! this is an awesome idea but it would also be awesome to make your own tiles or would that work with the paper and mod podge? but i was thinking more along the lines of a back splash behind the oven or tiles around the top of the kitchen counters. I printed out some photos different various vacations and put them on the tiles and applied 4 coats of polyurethane on them and I mixed them up with the plain tiles. None of them are in the line of fire so to speak of the water from my sink but are with eye view so when I am doing the dishes or cooking I can think of a more pleasant time. so far they are holding up nice but I am careful and only wipe them off with a damp cloth. These are lovely!! I’m tempted to do something like this on the bathroom tiles in my new house, to spruce the place up… But as I’m renting, it’d have to be a temporary thing… Can the glue or sealer be dissolved in any way, do you know? I just found this tutorial through Pintrest and I love these!! I have been racking my brain (and searching the internet) for ideas on what to do for ‘favors’ for my upcoming wedding. I think I might make two, wrapped with a bow for each guest at our wedding. Thank you so much! Super cute and easy. I just came across these on pinterest today. I am also a new follower. these look fabulous, and i cant wait to have a go. Keep up the fabulous work and good luck with all your little children. Found these coasters on Pinterest – and just finished my first 2 sets! LOVE!! I made some of these and linked back to your post. So cute! I just found this on pinterest on Friday, went out & bought the supplies and got busy. It was my first Mod Podge project & I am hooked! I loved it, it was simple & they turned out great! I used a tan tile (with a little raised flat middle part, and sloping edges) and some neutral travel themed paper & they look like I bought them in a store! LOVE IT! Will make many more of these for myself & everyone else…thanks so much! If you’re making a lot of these, put the felt on first & let dry, then after you put the paper on and they are stitting on your counter/table all day drying, the bottom of the tiles will not scratch anything they are sitting on. Also, if you’re making a bunch of these, just as an fyi do not stack them w/o the felt bottom (before they are sprayed with the top coat)b/c they will totally stick together. It’s not the end of the world if they stick, but a few of mine had marks on them b/c in transport to the backyard for spraying, I had stacked them. In the end, they turned out great. If you’re doing this for a wedding or something extra fancy, I would recommend painting the edges white b/c it’s a bit noticable when they are all stacked next to each other that they are tiles. Hello, Mine stick even after using a acrylic sealer. I used cork on the bottom for a more professional look, could the cork somehow be causing the sticking? I have the same problem. I used two coats of sealer and everything sticks to them. A couple were ruined from paper sticking to them! Im having the same problem with the tiles sticking together even after using acrylic sealant. Did either of you ever find a solution. I’m thinking of adding another coat on top of everything of polyurthane from the hardware store. Should the tiles be treated ? I had this same problem and found a solution. I added a little water to my Mod Podge to thin it out. Used a 1/2 acrylic paint brush and no more streaks or brush marks. I did 3 coats of Mod Podge and one (pour) of polyurethane and no sticking mad my hot mugs withstand the heat. To lessen the appearance of the streaks I switched to a soft bristle brush instead of the sponge. Seems counter intuitive but the lines are much finer. I am making these for sure for the ladies in my family this Christmas. Thanks! Pinning this for sure! These are beautiful! I am going to make them as Christmas gifts this year with some cute holiday scrapbook paper. Thank you so much for posting this tutorial! Has anyone tried making these with fabric instead of paper? I have some beautiful scraps. Perhaps pink the edges and then podge on the same was as paper? I loved these tiles! We were thinking of making some and hanging them on the wall ( as art)..however I was wondering if you have any suggestions as to how to hang them on the wall without ruining them? You can use plate hangers that you can buy at Hobby Lobby, Michael’s, Joann’s or any frame shop. Using these as wall hangings would be very cute! You could always try Command picture hanging strips. I love those things, no holes in your wall, easy to take down and holds up pretty much everything I’ve ever tried. I LOVE these and just made them last night (finally)! Perfect gifts for m friends! 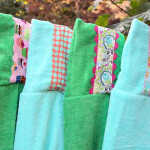 So easy, fast, and of course adorable and functional! Thanks!! I can see making them with grandchildren’s pictures, or family members, and it is a keepsake. Hi I made these last summer and sealed them with Mod Podge Gloss Clear Acrylic Sealer but they stick to the bottom of hot coffee cups. Did I miss something? thanx for any advice. I love these, what a cute gift idea! I will definitely be making these for hostess gifts! hi can u tell me what Mod Podge is, cause i can’t find that particular brand in my country. would appreciate your reply. thank u! So, I usually reply to each comment via email, but since I received several different questions, I thought I would respond here on the blog. 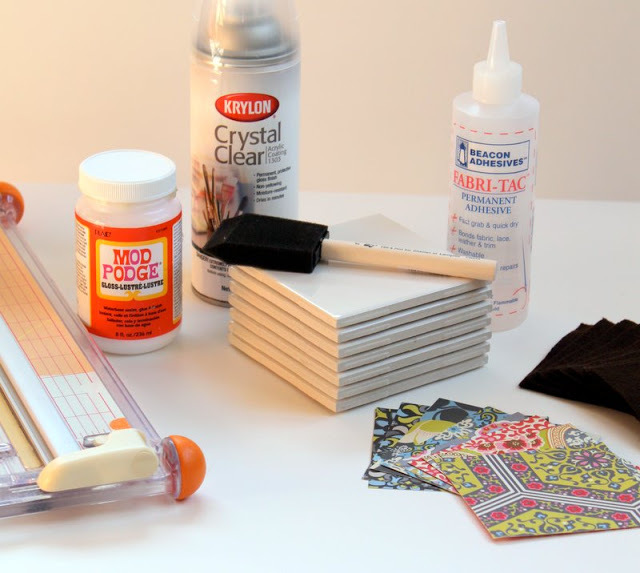 Mod Podge is a brand of glue that dries clear. I’m not sure of another similar brand for those of you in other countries. I haven’t had any problems with my coasters sticking, but make sure they are completely dry before stacking them on one another. Also, I think I used Krylon Clear Acrylic Sealer, so maybe not all sealers are created equal. If the brand you used didn’t work, try another one. Also, yes, you could definitely do these and put them on the wall….just leave off the felt and they are still just like regular tiles. I bought the most inexpensive tiles at our local Home Depot. I think they were 16 cents a piece. Fabric would be another great option! You could cut squares with pinking shears and use it just like the paper. The paper I used was from Michael’s Craft Store and was a bundle of Amy Butler prints. This is adorable! I tried it with my sister. We absolutely loved it! Family Christmas presents…check! Thanks! I love the patterned paper that you used! I used self-adhesive cork for the bottom of the coasters which worked very well! I just “finished” the coasters and they turned out beautifully… BUT I had flipped them over to glue the felt and assumed the acrylic sealer was dry (it felt dry and had been drying for 30+ minutes)… When I flipped them back over, parts of the newspaper print were stuck/transferred onto the coasters… I have tried EVERYTHING I can think of to get the print off… oil, baking soda, dish soap, hot water, toilet bowl cleaner, Comet, vinegar, nail polish remover, and toothpaste. I started producing these kinds of last night with regard to Christmas gifts this year. I obtained any package of 70 Some.25×4.Twenty-five flooring from Home Site, bought a handful of scrapbooking cardstock provides coming from Supermarkets, and purchased the entire content of my personal supplies coming from Supermarkets along with Amazon online. My spouse and i still should spray the polymer-bonded with them and place your experienced, yet (up to now) it is often So simple and pretty fun! I purchased a consistent coloring remember to brush like a back-up on the sponge or cloth brush and also ended up employing each depending on how properly one ran your ceramic tile, etc. Used to involve some difficulties with pockets under the paper, however it is not really that noticeable (that i’m absolutely OCD about this stuff.) At any rate, thank you so much for the directions/idea and also I am going to article as soon as they’re all accomplished! Hi, Have you experienced the coaters not being heat resistant? I made them and a regular coffee cup got stuck to the coaters. Just saw these for the first time today! I am going to make these through out the year so I have them ready to give as gifts for Mothers Day or Christmas! This looks so easy and fun to do. Thanks for the tutorial. They turned out so pretty. Good tip with the acrylic sealer…thanks! What a fantastic idea- and so easy! I found you through pinterest, I love your blog! Oh my goodness. I love it. I am so excited another refreshing DIY to try. 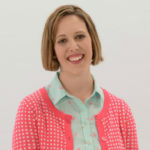 So loving your blog! I have a friend who did this but used Christmas paper napkins. They turned out so cool! LOVE this idea! This would make an amazing gift. And really the possibilities are endless!!! This is a great idea and your instructions were so easy to follow. I made some today and they turned out great! I just made some of these last night and they look beautiful and can’t wait to use them! However, I used the exact same acrylic spray you pictured and my tea mugs are sticking to the tile when I tested them =( Did you have this problem? Thanks for your help! I had re-pinned this on Pinterest a week ago.. and today I got the supplies and completed 6 coasters! Thank you so much for sharing this great idea! Here’s what mine looked like! (And a link to this page is attached to my photo pinned on Pinterest!) http://pinterest.com/pin/211598882462169437/ THANK YOU! Can’t wait to try this! But I want to use old holiday cards and wrapping paper. Thanks for sharing. This might sound like a silly question but do you know how much heat these coaster can withstand? This is a great tutorial thank you for sharing I can’t wait to try it. Thanks again for the wonderful tutorial! I tried sealing mine with laquer, but it’s not waterproof. The edges of the paper come up when the coaster gets wet. Is the acrylic sealant waterproof? Question – I have made the tile coasters as you describe, but after drying for days and I stack them and tie with ribbon, the tabs I used on the back leave a mark on the tile they are on top of. Can you help me out with this. I notice this question keeps getting asked, and nobody has a reply for this, and also no reply for heat resistant. These coasters are cute indeed, but I’m starting to believe they are for glamour only and not for use. I used cork on the bottom of mine and they stuck and left marks. I talked to a friend that does decoupage and she explained that ceramic doesn’t absorb so this leaves all the piles of things we put on them, just sitting there on top and then sticking. No ill regards to the owner of this particular tutorial, I got mine from some where else, and I am thankful you posted this blog, cause I was looking for answers to this sticking issue, and I think I have the answer now. I read that it can take up to 30 days for Mod Podge to cure. Not having worked with this product before I don’t know whether this is fact or fiction but it might account for the “sticking” issue ethers have been asking inquiring about. what a beautiful blog!! can’t stop admiring and smiling!! These are so cute, but was wondering about condensation & if anyone has had a problem with that since tiles are flat. Will the condensation run off the tile & onto whatever surface is around the coaster? I made something like these and depending on the cup or glass, the condensation makes it stick-not because mode pose hasn’t cured, but because of the suction that’s created. It can ruin a good table when a tile coaster sticks to the cup then comes crashing down. I wonder if there is a solution to this problem? Didn’t.t have an issue with the liquid from condensation running off the coaster though. Usually I reply directly via email to readers questions, but since there seems to be so many questions about the finishing on the tiles, I thought I would post here too. I did not have any problem with my tiles in regards to condensation with the sealer. Personally I have not used them with hot beverages so I can’t say whether or not that would be a problem. I’m sure climate is a factor in how well they dry. I would wait several days before trying to stack them on top of each other. So glad you guys love this project and if anyone has found a product that works better for sealing the tiles, please feel free to share it! Thanks so much!! Yes, paper will wrinkle when you apply Mod Podge or any moisture to it. The trick is you need to seal the paper so that it doesn’t absorb moisture from the glue, which would cause the puckering. Try spraying acrylic sealer to the front and back of the paper, letting it dry and then adding the Mod Podge. Painted tiles as shown above are excellent designing tiles for home renovations. Thanks for posting these presentations. Can you do this with photographs instead of scrapbook paper? Maybe photos printed on computer paper? Thanks for the tutorial! I tried these using the exact same method & supplies you describe. The problem I’m having is that mugs holding hot liquids tend to stick to the coaster. Anybody else having this problem? Ways to troubleshoot? I am having this issue too. I am going to autozone to get some clear coat heat resistant spray (they usually use it on car paint and on engines) I am going to spray it over the acrylic spray I used. I figured I’d experiment with that to see how it works. I’ll let you know how it goes! I’d love for these tiles to be functional so I can give them out as gifts! Michaels arts and craft store has lovely christmas scrapbook paper so these are great gift ideas. I made these once for a bridal shower, using the engagement pics of the couple, in black and white. Turned out so cute. Thanks for this easy tutorial,found it through Burlap and Blue blog. Ive been wanting to try this but wasnt sure if id be able to pull it off but,thanks to your easy tutorial I know I could do this! Using make up sponges works better because the streaks are not as deep. Also I’ve used something other than spray sealer because I live in a loft and can’t really spray in or around my home. Great results! Do you know what kind of sealant I can use that’s heat resistant? A few of us are having issues with hot coffee mugs sticking to the tiles and leaving coffee mug rim marks. I’d LOVE to distribute these gifts over the holidays but I prob won’t if I can’t find anything to make them more functional. Maybe some heat resistant clear coat spray from autozone? I might try that. What do you think? Thanks for the tutorial though- they are pretty and mine came out great as well! Awesome idea! 🙂 These are so cute and added to the decor of our new living room furniture! Una pregunta… los papeles de bloc de notas, son papel o tela? lo digo porque si es papel… al mojarlo con la cola y el sellador no pasa nada?? Hi! I wanted to let you know I saw this tutorial on Pinterest and shared a link to your tutorial and referenced your blog on my blog! Thanks!! 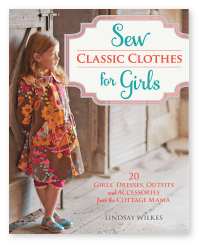 CAn you use fabric instead of paper? Great blog. Very helpful for people that want to try this at home with your instructions. Very creative. thank you for sharing! These are fantastic! I had a friend show me how to make them and they turned out great. So here’s another semi-unrelated question: I’m giving them as teacher appreciation gifts at the beginning of the school year. Does anyone have a cute saying I can put on the gift tags? I’d like to include something with coast or coaster but I don’t want to insinuate “coasting” through the school year (it’s a TOUGH job)…any ideas? Thought about using something like don’t “sweat” it (condensation from glass…), but not sure I like it…THANKS for any suggestions! Lovely! You should be giving us, a great plan, as how to make tiles beautiful in house, by your creativity. I will try these formulas, to make tiles, beautiful. Hey Lindsay I really liked your collection. Your handmade products are very informative. Can we use them as send gifts to my friends? Beautiful idea—I am coming late to the game here judging from all the comments but am reading all the other suggestions and think that everyone has some additional great ideas to help make these beauties even better. Thanks for the tutorial!!! Great idea! Soft finish includes vinyl and cork tiles, all softer and warmer underfoot than most hard tiles and generally less costly. These tiles are easy to clean and lay, and, in the case of vinyl, available in an extensive range of designs. Tried with napkins first time around. Didn’t turn out good at all. Found your blog and tried again with paper. Love it! I have a few months until Christmas, so it should be enough time to let them dry. Thank you for the cute idea! I am hooked. You saved me of trying to decide what handmade items to make for Christmas gifts. Yours are gorgeous. Thanks alot. Great tutorial. I’ve been pinning a lot of DIY coasters lately, but yours take the cake. Thanks for the clear and easy tutorial. Now I know what to do with all of those wallpaper samples I have! Love the colors/patterns on yours! I tried some myself! The problem I have is that the paper puckers. Any ideas fellow crafters? The paper will pucker b/c it’s absorbing moisture from the Mod Podge. Spray acrylic sealer on it and let it dry so that water doesn’t get into those paper fibers. I’m having the same problem with heat resistance. Has anyone tried the automotive heat resistance sealer yet? Did it work? Thanks for the feedback! Not sure if this will truly work, but I googled the heat resistance problem and found a few mentions of using PermEnamel clear gloss glaze (by Delta)as a solution. It is specifically for glass, ceramic, and tile and the description on one site states, “Dishwasher safe and microwave and oven safe to 350 degrees. Not for use on surfaces with food contact.” I made my coasters today but I will need to go out and find this product to seal them better! I’m making these tonight for a bridal shower this weekend. I bought wedding themed scrapbook paper and also purchased some large letter stickers to place on the paper – for the first letter of their last name and also number stickers to add the date of their wedding to a couple tiles. Just to make it a little more personalized. I see, though, from your picture that you used gloss mod podge. I’ve never worked with mod podge and there were many different kinds at Michaels. I, unfortunately bought matte mod podge. Should I exchange it? What difference will this make on my coasters? At the tile store right now!! Can’t wait to start this craft tonight! I’ll be making at least six sets of awesome coasters for Christmas gifts. I have finally found a use for the giant stack of scrap booking paper I have!!! Thank you so much!!! Where did you find all that gorgeous paper? i attempted to do this last year and bought a bunch of tiles and never got around to doing it. man these look greaT! love it. you have inspired me to make this attempt again. I am also having a problem with the paper puckering… I am using standard scrapbook paper from hobby lobby… any ideas??? Thank you!!! I’ve made 4 sets of coasters in the past 2 days. So easy and they make fabulous gifts. Instead of felt, I used foam, cut into 4″ squares and glued them to the bottom of the tiles with “Weld Bond”. I found that the foam prevents them from slipping/sliding. As far as sealant, I used Valspar Clear Sealant (in a satin finish. This dreid very quickly anf I’ve had no problems with tiles sticking together. Did you see if hot mugs stuck to them? I’m currently making them to sell and am having a heck of a time finding a sealer that hot mugs won’t stick to. I don’t want to do the engine sealer, as it has a VERY strong smell! I am about to try the Valspar you used and the PermEnamal mentioned in another post. Did either of these work? Thank you! Very cute! Can’t wait to make some! After your coasters have cured for three days, put a layer of paste wax on each coaster; the cups stick when the coating is new-ish and usually stop sticking after the coating has cured for a few weeks! The wax will get you past that curing period. Thanks for post! Wow nice Tiles Collection Tile Shops Totally Home improvement Solution TFO in australia. What do you think about the different types of area rugs over at Rugman.com? I really like your bold ‘in-your-face’ close ups of larger designs on these coasters. I have been making these for years but have only made them using paper napkins. Thanks so much for sharing and just in time with summer here and lots of time to try new things! It seems a lot of you have problems with mugs sticking to the surface of coasters. I had that problem in the beginning too. I found out that the best solution is to use two components hobby epoxy resin (something like this: http://www.tapplastics.com/product/mold_making_materials/casting_products/easycast_clear_casting_epoxy/386. Since I live in Croatia I use other kind, but it’s the same principle). It solves both problems as it makes coasters heat and water-resistant. In the floor tile shop right this moment!! Cannot wait around to begin this particular art this evening! 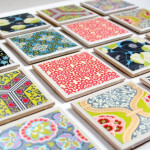 Soon we will be producing a minimum of 6 units associated with amazing coasters with regard to Presents. having fun making these, I have started 6 sets of 4, and they are in various stages. going to try to buff out some of the modge podge streaks and spray on the acrylic again for a more sheen finish, see if that works, but overall, these are really cool! And I am curious to see how these would turn out using fabric squares cut with pinking shears in lieu of the craft paper, hmmm… Think I will try those this weekend. They look great but are they absorbent? What about condensation? What did you use to make it water proof? 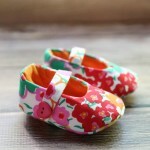 Oh my goodness, these are seriously adorable!! Awesome idea!!! Thank you!!! This is Evonne from Taiwan, I love your idea about a handmade coaster. I want to make a number of coasters for my wedding gift and have a few questions below, please kindly have a look and let me know. Thank you! 1. For the step 2 to 4, how can I sure if I brush enough Mod Podge on the paper or tile? Shall I brush the same quantity of Mod Podge every time or not. 2. For the step 5 about the Clear acrylic sealer, I plant to make about 200 coasters for the wedding and want to evaluate how many pots should I buy? And how many times should I press by Clear acrylic sealer every time? Can fabric be used on the top instead of paper? I’m sure it could…….give it a try!! These are so amazing and so simple! I can’t believe I only just found them! Thank you these will make amazing stocking fillers! Thank you for sharing! I LOVE this idea and plan to make these for Christmas presents this year. Love the website!!! I’ve just made these today, and the “flat” (typical) scrapbook paper looks great! Unfortunately, I also chose a textured paper, and it turns out it sheds when spreading the mod podge, so I’d suggest not using textured paper. Also, I read a lot of comments about the finished product not being too heat resistant when using coffee cups on them. I purchased acrylic sealer (DecorArt Triple thick gloss glaze) that the lady at Michaels assured me was water resistant, but I was wondering if someone had found something that for sure works against heat and sticking? I’m giving these to my mom for Christmas this year, so I don’t have too much time for them to “cure” unfortunately. WOW! So super easy! Simple and elegant! What a great handmade gift. Thank you so much for sharing! So want to do this project now! Love your crafts. Especially your coaster ideas. Hi, Loved the Coasters you made and I wanted to know if the sealer you used is good enough as a heat resistant for the coasters? I have made tons of these for a c raft fair. To make them heat and water proof, try using clear engine paint with a high heat resistance. About 500-600 degrees. That works. Acrylic spray will not be heat proof. Only issue I am having is I find very small little black things stuck in some of them (after I cover with the modpodge). I don’t know why it happens. I have been told it could be from the paper or dust in the air. I am trying to find a way to prevent it. Does anyone have some ideas? 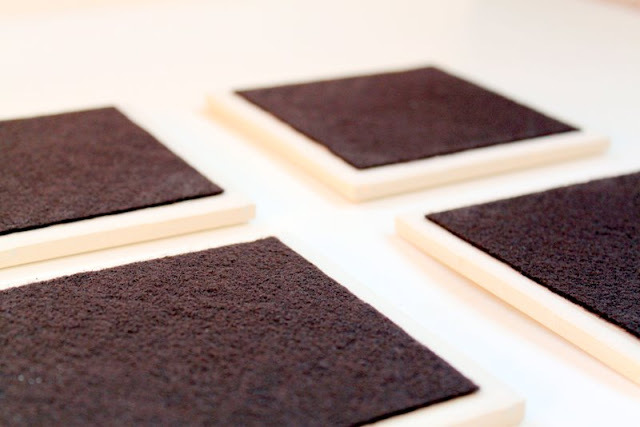 The small black things on your project is probably particles coming off you sponge brush. I have had this before when working with Mod Podge. Use a paint brush made for polyurethane or other finishes to apply Mod Podge. Bonus: You can wash brush and use over and over. Do you have to cure the coasters once you have sprayed it with the engine paint like the can says to do?Like bake them in the oven? What kind/brand of engine paint did you use? They’re so lovely. It’s a very good idea. Thank you so much for explain it. I was wondering if they could be used as a conventional tile – on a wall? I think they are beautiful and almost seem wasted as coasters. Can anyone give me some advice please? I love these tiles and have tried making one but am getting streaks in the mod podge despite using the foam brush to apply. I’m wanting to make sets to sell so need them to look as good as possible and the streaks don’t look good. My creative juices start flowing when I see something like this. 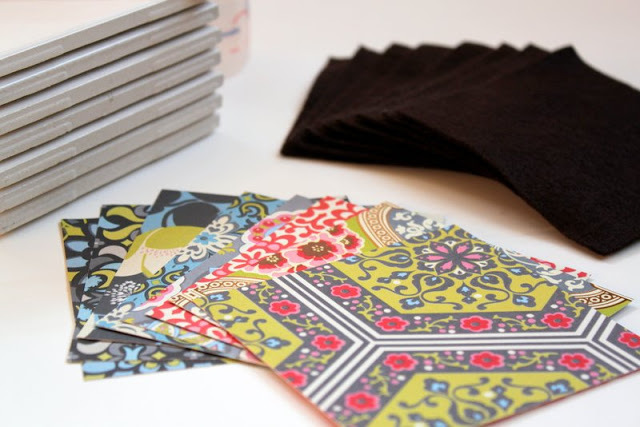 Imagine in your kitchen….the backsplash is all a neutral color and the center row which doesnt begin all the way from a wall , but somewhere in the center is a zigzag row of these in whatever color or design you fancy….then make you coasters to match. Thank you for this beautiful post. I’m working on about 50 of these to sell in my shop for an upcoming festival in our town.. So far I have done 3 coats of modge podge letting them dry or so between coats.. no sealer..so far water was fine (no sealer btw) but put a hot coffee cup on and it stuck within a minute. This was after a week of letting it all cure.. because I saw all the comments of the acrylic sealer sticking, I skipped. It to see what would happen.. I’m not trying fast drying poly and gonna let dry proper 3 to 4 hours..3 coats and try this..gonna let cure a few days and dry a hot cup again.. I’m also going to try the clear engine paint that I’ve seen here a few times and will post final outcome. Some of these products are expensive to keep making mistakes.. If anyone had a sure outcome.. (I’m not much interested in pouring resin) let me kno. w. August 23rd 2016. I mistyped.. I let the mod podge cure a day or two in between. I also think temperatures you do this in are important.. read back of product.. Humidity is never good I know for paint or a sealer.. Every paint or sealer project I’ve ever done in heat or humidity has never cured well. I was unable to us the coasters after I made them because my cups stuck to them and left marks in the coaster, didn’t matter whether hot or cold!! I found the solution was not acrylic spray or polyurethane, but something called “Envirotex” sold at Hobby Lobby. $12.99 for a small box which when used sparingly covers a lot, just work the coaster back & forth to move the liquid around, otherwise follow manufacturers instructions. You will find it in the craft paint isle!! I followed the tips and tried to make Tile Coaster, while the final shape was done and really thanks to the author.